The Oregon State Marine Board (OSMB) requires at least one U.S. Coast Guard approved Type IV PFD (ring buoy OR cushion) on a boat 16 feet or more in length, in ADDITION to a properly fitting, wearable US Coast Guard approved PFD required for each person onboard all boats. Manually propelled canoes and kayaks 16 ft in length and over are exempted from carrying the additional Type IV PFD. Someone being towed behind a vessel is considered to be onboard. PWC operator and passengers must be wearing their PFD while underway. Inflatable PFDs are not approved to use during high impact sports such as water skiing or operating a PWC. Inflatable PFDs are not authorized for use by children under the age of 16. However, some hybrid inflatables have been approved for children. All children 12 years of age and younger on an open deck or open cockpit, must be wearing their PFD while the vessel is underway or while being towed. Beginning January 1, 2010, all persons operating a boat as well as all passengers in the boat will be required to wear an approved and properly secured U.S. Coast Guard PFD on all Class III rapids and higher. A boater with a blood alcohol content (BAC) of .08% or more is considered to be under the influence. However, a boat operator showing any sign of impairment due to alcohol or drugs is subject to arrest. BUI is a class A misdemeanor punishable by up to one year in prison and a maximum fine of $6,250. If the boater is found guilty of BUI, they will be required to complete a safe boating class, are not allowed to operate a boat for 1 year, and will have all boat registrations in their name suspended for 3 years. Any person operating a boat on any Oregon waters have given consent to submit to breath and field sobriety tests. All vessels propelled by machinery, including gasoline, diesel and electric motors, and principally operated on Oregon waters must be titled and registered by the OSMB. U.S. Coast Guard documented vessels must also be registered with the Marine Board if classified as a recreational vessel. Vessels that are properly registered in another state and that are operating on Oregon waters for no more than 60 consecutive days. It must be carried onboard when operating the vessel. It is valid for two calendar years and expires on December 31st of the second year. The OSMB must be notified within 30 days if the boater changes residences. Letters must be separated from the numbers by a space or a hyphen. The decal which is provided to you by the OSMB should be displayed on both sides of the boat. Lack of the correct documentation may result in delays and fines. Make sure all boats are properly marked and documented. 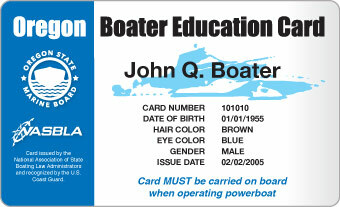 It is a requirement to carry your Certificate of Number on your boat. $3 / foot (round up) plus the Aquatic Invasive Species Permit surcharge of $5. Non-native aquatic species (plants, fish and animals) are found within Oregon's waters. These pests can increase dramatically under the right conditions, displacing native species, clogging waterways, and impacting navigation and recreation. Once introduced, they are nearly impossible to eliminate. Zebra and Quagga Mussels are nuisance species that can be accidentally transported by recreational boaters when attached to propellers, intake systems and hulls. Empty bait buckets and remove any plant fragments from bait wells, fishing gear, trailers, dive gear or props. Dispose of the plant fragments on land, in a garbage receptacle. Report sightings of non-native species to 1-866-INVADER or call 1-800-437-2744, 24 hours 7 days a week. Beginning January 1, 2010, Oregon motorboat and sailboat operators will be charged a $5 surcharge to their boat registration fee. 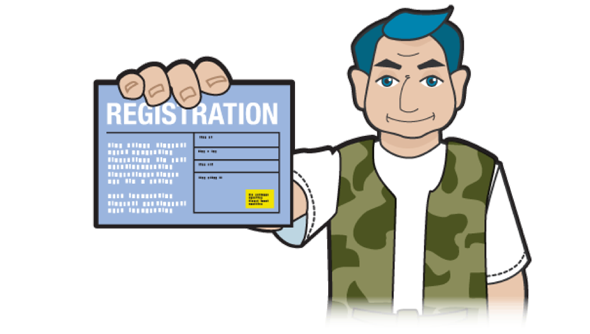 Current registration decals act as proof of payment and are valid for two calendar years. Out-of-state operators of powerboats and sailboats must purchase an annual $22 ($20 permit + $2 agent fee) AIS prevention permit, available at Oregon Department of Fish and Wildlife license agents or go online to www.boatoregon.com to purchase your permit. Beginning January 1, 2010, Oregon resident operators and out-of-state operators of canoes, kayaks, drift boats and other manually powered boats 10 feet or longer must purchase either a one or two year Tyvek tag for $5 or $10 from the Marine Board by our online store at www.boatoregon.com. All non-motorized boaters must carry their AIS prevention permit when paddling or rowing on Oregon waters. One permit is required per boat when the boat is in use and the permit is transferrable to other manually powered boats. ATTENTION: out-of-state operators of all types of boats, PLEASE clean your boats before entering Oregon waters, especially if you come from a state that is infested with Zebra and Quagga mussels. Do not underestimate PWCs - they are very powerful for their small size and demand the same respect as any boat. In fact, PWC operation must adhere to the same rules and regulations as any other powerboat - including registration with the state and a B-1 class fire extinguisher aboard. The operator as well as all passengers on a PWC must be wearing an inherently buoyant U.S. Coast Guard approved Type I, II, or III PFD. When towing someone on a tube or on water skis, there must be capacity on the PWC to accommodate the operator, the observer as well as the tuber/skier(s). PWCs must stay at a distance of 200ft from other water skiers or others being towed behind a vessel. Within 200ft of shoreline on all lakes, reservoirs, and bays. PWC operators in Oregon must not exceed 10mph when approaching within 100ft of a motorized or sailing vessel that is underway. PWCs may be operated at all hours of the day, but must be fitted with the required lights in order to operate legally between sunset and sunrise.